The above photo illustrates the combination of traditional and modern culinary thought by celebrated chef Enrique Olvera. Graduating from the Culinary Institute of America Snr. Olvera set himself back in the culinary mecca of DF. Rather then imitating the New York food scene, Enrique opened Pujol with a daring approach – combing modern culinary techniques with the traditional ancient jewels of Mexican cuisine. You can taste his success, but if you are looking for rankings, in 2012 Pujol ranked number 36th best restaurant in the world. In 2014 we see a big jump up to number 20. Kudos to well deserved accolades. Pujol offers two tasting menus: ocean and earth. We ordered both, only adjusting Earth to be vegetarian. Thankfully – and contrary to many cities – this request was not an issue; quite contrary, the chef was pleased to adapt and create special courses for us. As an overture to our evening we were presented with perfectly round pumpkin emitting a aromatic smoke. Inside, to our delight, were smoked elotes skewers (baby corns) with a dipping coffee mayonnaise and ant dust. An then the parade of mezcals and memorable delights began, starting with an extensive list of mezcals and the best sangritas we had in all of Mexico! Service was to the top, no pretension and just lovely service. Again, like Biko and Dulce Patria, the sommeliers and waiters, were educated patient and knowledgeable; giving detailed descriptions and answers to our endless list of questions. Chicharron de Queso is a cheese tuile topped with three different avocado puree; one with chapulines (grasshoppers); the second one with pico de gallo (fresh chopped red onion, tomato, chile and lime) and the third avocado pure topped with tomatillo, cilntro and a bit of green chile. Inflaita de huevo is an inflated fried tortilla filled with potato mousse, a little bit of black bean puree, red chile sauce with chapulines (grasshoppers) and wild cilantro topped with a perfectly cooked egg. Yes it is a sous vide cooked egg – perfect texture all around. One grilled octopus tentacle tempura’d on one end and topped with pico de gallo (fresh chopped red onion, tomato, chile and lime) on the other. Adorned with olive sauce and basil reduction. This dish has a striking presentation and is cooked point to perfection. This is one of the menu items were you can clearly appreciate the quality and freshness of the ingredients and see where the top ranking is deserved. Fish (robalo) ceviche taco; the tortilla was made with chayote and hoja santa topped with black bean puree, serrano chile, totomoxtle (the dried husk of an ear of corn) powder and dry chiles with lime juice. Thinly blown sugar sphere filled with piloncillo (unrefined sugar that is commonly used in Mexican cooking), ice cream and guava puree. It is topped with tiny lime meringues, peanut powder, amaranth crumble and mandarin gelatin. We don’t know what was more impressive, the texture or the flavours – not to mention the super skilled pastry kitchen, blowing sugar so thin and perfect requires years of practice and patience. Caramelized camote (sweet potato) crunchy amaranth tuile, yogurt ice cream, milk panacotta y guayabato (large guava with pink flesh) puree all the ingredients complemented each other seamlessly. Lime margarita granita with cointreau cream and meringues topped with lemon zest and begonia dragon petals, not only beautiful but very refreshing like a bowl of snow. At the very end of our meal we had the Chipilín Sorbet. Chipilin in an herb similar to the verdolaga and it grows in southern Mexico places like Chiapas and Oaxaca. It was flambe’d in mescal in a colorful last performance. Biko, another of Mexico DF’s restaurant jewels, is full of surprising textures, colors, flavors, scents and emotions. 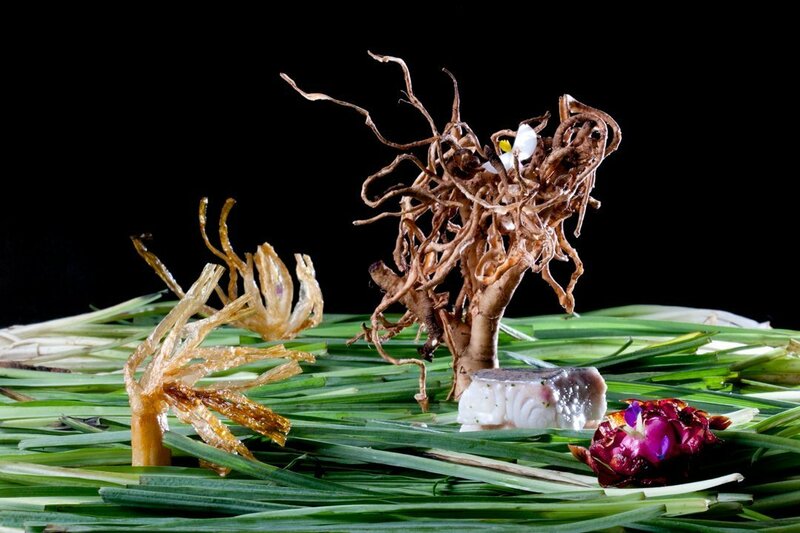 Looking at the two extremely artistic and diverse chefs, one can see where all of this creativity comes from. at one of the most prestigious schools in Spain – the Luis Irizar in San Sebastian. Soon after, a job offer brought him to Mexico where he met Bruno Oteiza, a young Basque with an extensive resume, having worked in top restaurants both in Europe and Mexico. From these two wonderful minds, comes the creation of Biko. 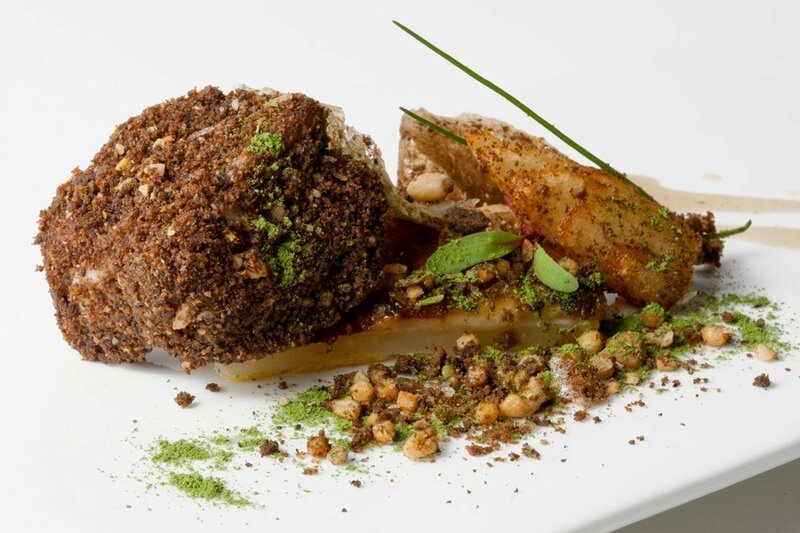 For the last three years Biko has been included in the World’s Top 50 Restaurants and this year (2012) it has been awarded with the #38 position. Biko offers three menus: ‘Creative’,’Traditional’ and a chef’s tasting menu. The orientation is avaunt-grade Basque with a Mexican adaptation. We were welcomed with a foam of beetroots, quite very gentle flavour and ethereal texture, while retaining the robust earthiness of the beet. Happily, we chose 5 dishes and desert from the Creative menu- as it seemed the most exciting! The staff was very knowledgeable and accommodating. An amiable touch was that when they noticed we were sharing, they plated each dish into half-portions for each of us, so we could better share the presentations individually. Unfortunately, we were not able to take photos of our meal as we were only able to visit during dinner service. We think it is a bit rude during that time to bring out the camera and lights, etc in such a formal environment. So the photos do not match up with what we so scrumptiously enjoyed. Hopefully the words will bring out the flavors that live on in our pallets! “Espárragos con Aromas de Campo” – White asparagus braised in the salamander with a mojo de alcaravea, rosemary and verdolagas bathed in a vinaigrette of green and white asparagus, topped by a sheet of camomile and flowers.
. Delicate and delightful, truly giving off the smells of a sunny alpine meadow. A bit of gelatinized chamomile suspend over the bed of asparagus below. Each bite was light and promising, like the first day of spring. What we found very impressive over the course of the meal was how each dish was more powerful then the prior. We ordered in no particular sequence, but the kitchen presented each dish in perfect progression. With the flavors continually growing stronger and the denser. As an accomplished sommelier will trot out white wines, then roses and finally the reds during a tasting. Such that the heavy flavors do not overwhelm the palette and hide the finesse of the lighter grapes. “Hamachi y Aguacate” – Hamachi marinated in mirin, dark beer and soy sauce with avocado and micro croutons. We just about ordered this simple yet exquisite dish again for dessert. The perfectly supple Yellow Tail was bathed in a sweet and sultry glaze. The fish was so soft that it reviled the avocado. Simple idea with mouth-watering results. The bowl arrived with a perfectly spherical ball of shrimp melded with avocado, surrounded by a sprinkling of herbs. This treasure was then buried under a bean broth poured over the top by the waiter, after we had a chance to take in the composition. Strong in flavor and delicate in texture, this was an outstanding soup breathed the aroma of earthiness from the pureed beans. 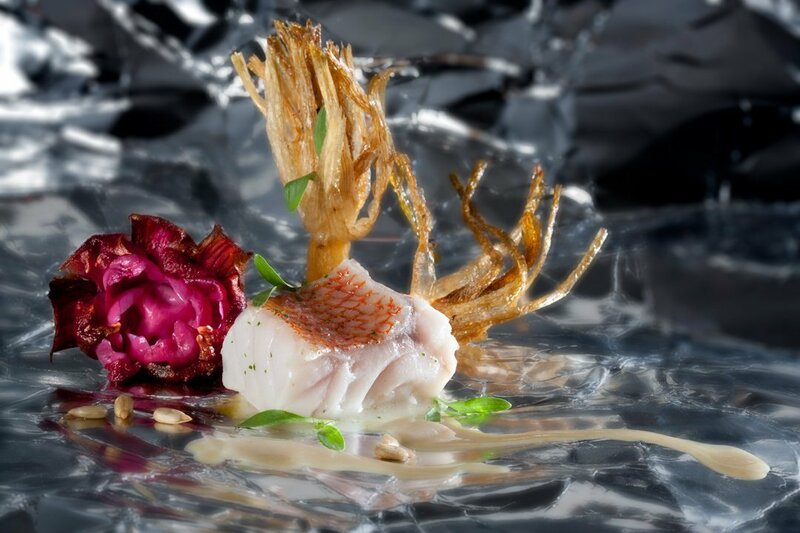 “Pescado con Costra de Hongos y Refrito Aireado” – Robolo (Sea Bass) grilled with sauce of mushrooms and almonds, with potatoes and fried quintonil and an espuma of fried garlic oil, vinegar and porrusalda. A very nice fish that would have been much more memorable had it not been for the life-altering dish that came after and wiped it from memory …. One bite put me into shock. I was not able to take another bit of food, and could barely move, for approximately 3 minutes. Stunning in the literal sense of the word. I believe that this Pescado en Pipián is the perfection of Sous Vide cooking. The fish was moist and fresh and little puffs of steam came up and it just melted in your mouth. It was wrapped in a green cake of pumpkin-seed (Pipián) mole. Mole is almost never used for seafood, but in this case you can see how tradition can better for change. After having the Roboalo with Habenero and Polenta earlier in the day at Dulce Patria, we were very worried that it was not possible to produce a better Robolo.. Happily we were so very wrong! Ok, this we ordered just for the name and concept, and conceptually it is amazing. 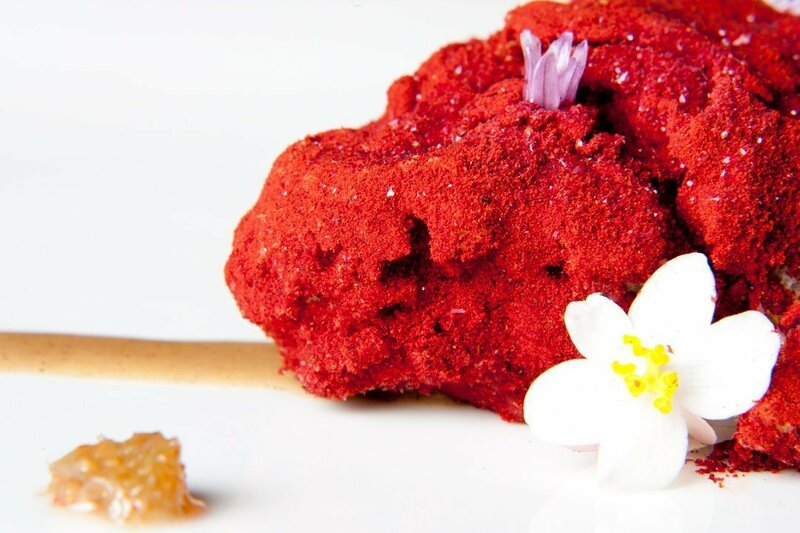 “Trufas Bronceadas“ – Spheres of molten chocolate dusted with bronze, served beside wine cured strawberries, an oven-dried fried pulque & nut cake, served with butter & lemon ice cream. 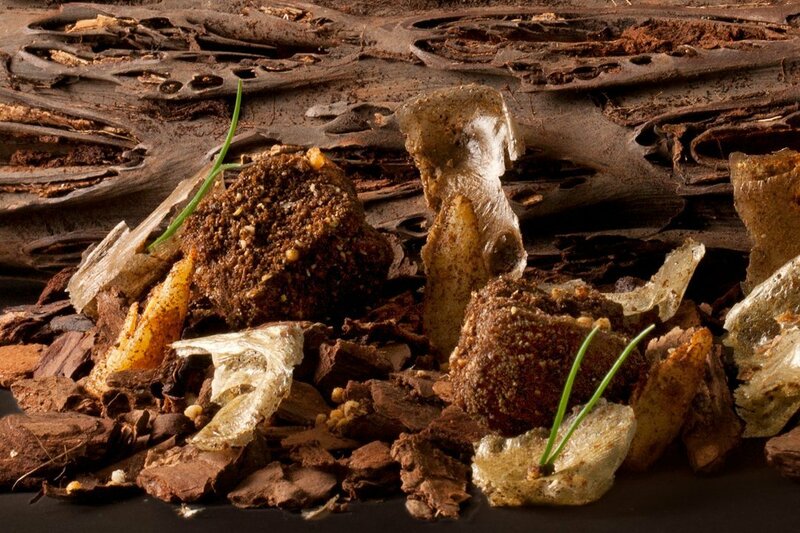 However, no dessert can stand next to the ‘Bronzed Truffles’. Easily one of the most spectacular of desserts we’ve ever had! Spectacular being also in the form of spectacle – an amazing performance by a dessert! This was a 4 stage process that was a true culmination to an evening of gastronomy that had built from the first bite. Fill your mouth with the malto-dextrin and let it melt on your tongue. (Think powdered sugar). Place the spherified molten chocolate truffle in your mouth with the wine-marinated strawberry and wait until it explodes, a chocolate bomb going off in your mouth. Follow this with the dehydrated cake to soak up the chocolate and add the slight woodiness of the nuts. Taste the completely opposite, yet complimentary pallatte cleansing flavor of the lemon butter iced cream. We immediately ordered the Trufas Bronceadas a second time. It is not meant to, nor do you wish to, share! After a short, but impressive, time in Mexico enjoying the barrage of flavors that assaulted us each time we ventured outside. It was amazing to see a restaurant really stand out above the rest. Biko is true 3 hour culinary artistry journey that had us traverse a perfect plot triangle.